The tormented spirit of Pumpkinhead has once again been let loose to seek vengence among the living. As one of the Keepers of Spirits it falls to you to end his reign of terror, if you can. Enter the cavernous realm of the spirits. Stop by the reflecting pool to watch a group of foolish teenagers raise Pumpkinhead from the his crypt then carelessly burn down the home of his guardian witch, Ossie. Now only you can stop the slaughter. You must traverse the dangerous netherworld on your quest. Beware, Pumpkinhead is now awake and also wanders these dark halls. If you should accidentally encounter him before you are prepared, he will certainly destroy you. With luck you will be able to find a hiding spot. Search for portals which will let you view the living and offer clues as to the targets of Pumpkinhead's wrath. You find that Ossie lays in a coma, hovering between death and life. Her spirit begins to break free of its mortal restraints and ease into your world. Find her, for no one knows more of the creature than she. She is the only one who can give you the clues to defeat the creature for good. But always remember with whom her allegiance lies. She, like you, wants Pumpkinhead to be freed from his torment but she also wishes for him to complete his evil quest first. Learn what you can from her but take it with a grain of salt. You should also realize that when the old woman finally breaths her last and slips to the afterlife, Pumpkinhead will have lost all restraint and will be more dangerous than you can imagine. The caverns also contain the weapons you need to defeat Pumpkinhead. Don't attempt to enter battle without them or you will be doomed. However, you also cannot allow the death of an innocent. You need not destroy the monster to save the living. He can be driven away if you have the cunning and bravery. You will not be able to give Pumpkinhead his ultimate rest alone. You must find help among the living. Obviously, though, you must pick an ally who is not only willing but able to gain the beast's trust. That will not be easy. Watch through the portals to learn who Pumpkinhead seeks and who might be pure of spirit enough to help you in your quest. I've been a gamer for some years now, and I feel like I'm one of the very few who own this really nice game based on the Pumpkinhead series. It's a first person shooter, but not the same old "get the key and kill everyone", Doom style. It's a much more refined game, I'd say (graphics aren't a big thing if compared to today's games, but the soundtrack is still really scary). You will find some enemies throughout your path in really dark mazes where you can, if touching its walls, enter into another dimension and be ported to another place. That's very original if you ask me. As you kill the enemies, you can enter a different dimension to get energy. You use this energy in screens hidden throughout the maze. 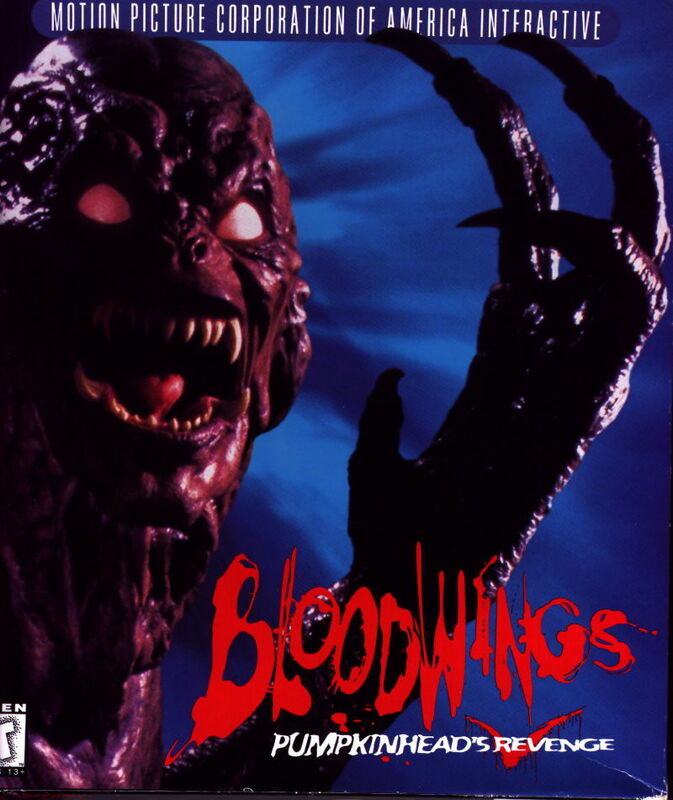 In these screens, different scenes of the movie Pumpkinhead II: Blood Wings will play, and your objective is to take things that appear in scenes, like a wallet, a gun, an ID, or anything you could actually use throughout your journey. I never completed this game since I got stuck in it, but as far as I've played, it's worth your dollars. If you can find this little game somewhere, buy it and have some fun. I remember this game. When I played it I never knew that the movie scenes were actually from the film (or indeed that they had done a sequel to Pumpkinhead at all). Sad for the film because the acting stinks, but was kind of what you expected for interactive movies in those days. The game was kind of a first person shooter, but more in a (simplified) puzzle sense then a mass combat type. Really it felt to me more like Dungeon Master then Doom. You are walking around various dimensions trying to find out the secret to Pumpkinheads rage. You have to collect energy which you then use to open portals to "our world" which is where you see the movie scenes. The movie scenes give you information and allow you to collect items that are lying around in those scenes which you then get to use later. At some point, after solving all the basic puzzles you actually get to face Pumpkinhead. He's too hard for you to fight but by then you should have found his secret, where you have to present him with a key object where upon you win the game (and get another cut scene). Pumpkinheads secret is pretty obvious and it's a bit sad you don't get to see much of Pumpkinhead in his computer game. But the game itself was pretty playable, about the right difficulty and kept me interested until the conclusion. Pretty much no replay value though.